So that long road race is coming up, and you’re starting to think that getting a few bottles during the race would be a big help for staying hydrated. The feed zone is a tricky place, both for riders and the people feeding them, because most people—on and off the bike—don’t do it much. If you’ve never done it before, race time is not the right time to learn. If putting 1–3 bottles in your jersey will be enough for the race, that’s the best way to go. If that won’t suffice, then make time to practice before race day. It’s great that Billy’s girlfriend volunteered to help at the race, but if she doesn’t dress like Mother Theresa, she shouldn’t be asked to do her great works either. Feeding a team during your first race is totally unrealistic! And if you’re a friend of Billy’s, you won’t do that to his girlfriend. Plus, you’ll have a better chance of getting your bottle. Hold the bottle correctly!!! Refer to image shown here. 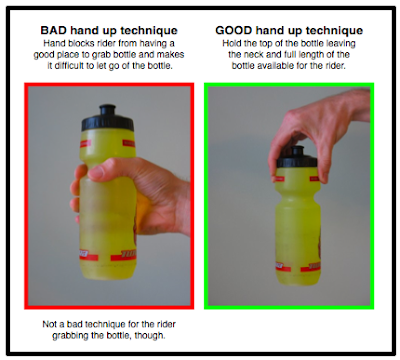 Let the rider absorb the impact of grabbing the bottle—don’t try to run along or move the bottle in the rider’s direction to lessen the impact. It’s a bike racer you’re working with, not an All-Pro Wide Receiver, and there are usually lots of other people in the feed zone. New soigneurs should only try to feed one rider, two max. With more experience for rider and soigneur it’s possible to feed more riders but still tricky. Feeding is a learned skill, so practice it! Plan feeds earlier than needed in a circuit race so you can always have full bottles with you, even if you miss a feed one lap. Writing your name (and team name) on bottles helps you get them back, but expect (and plan accordingly) to lose some. Find a quiet street/road with an uphill—hopefully the races where you need to feed will also have a hill at the feed zone. Practice with the soigneur on the right side of the road. This is the side you will feed in most races, plus most riders are right-handed which will make this easier (sorry lefties). Rider holds line and keeps eyes on bottle as taking feed to properly catch bottle. I recommend wrapping the bottle into your chest to hold it securely (sort of like it was a football) and making sure you still have a safe line through the feed zone. Expect the feed zone to be a bit chaotic during a race, but focus on getting into position (or out of the way) before entering the feed zone, and holding your line through the entire feed zone. In this video, riders are going through a feed zone picking up musette bags and grabbing bottles. They make it look very easy, and you’ll probably have a hard time picking up the feed zone action until you’ve watched through the video a few times. Look for riders slinging musette bags over their heads they have just grabbed, and a few bottles being handed out. Everyone continues to ride a steady pace and a smooth line. Watch the upper left corner as the soigneur with the white and red shirt hands out three bottles from 0:23–0:28 in the video.